College life is more than 8 a.m. classes, research papers and exams for four women enrolled at Mercyhurst University North East in Erie County. It also means studying well past midnight after they’ve fed their rambunctious toddlers, read them books and tucked them in for the night. The scenario is repeated most days, amid the usual runny noses and occasional tantrums. For these single collegiate moms, responsibilities don’t end there. Most also hold down a part-time job to pay the bills. But mercy has come to the aid of students Jasmine Butcher, Daijah Campbell, Quanshay Carroll and Jennifer White. All have been accepted into a new Women With Children program offered at Mercyhurst North East, a two-year Catholic liberal arts satellite campus of Erie’s Mercyhurst University. The groundbreaking program’s biggest perks are rent-free housing on campus, including free utilities, laundry services, cable and internet service. All of the women agree that the daily chaos and worries of attending college and raising children — on a single income at or near the poverty level — are more bearable now. “It’s been a blessing on top of a blessing,” says Quanshay Carroll, 23, who entered the program in January with her 4-year-old daughter, Delaysia. The words “blessed” and “grateful” come up frequently during a recent talk with the women at the school’s Matthew L. Ryan Student Union. They watch as Delaysia, a newcomer to the program, plays with Jasmine’s daughter, Noella, 2; and Daijah’s daughters, Dallas, 2, and Dasani, 4. White’s 2-year-old son, William, isn’t present that night, but subsequent get-togethers quickly include the only boy in the group. Stress can impede growth on many fronts, both physically and mentally. A 2018 paper released by the Institute for Women’s Policy Research found that single mothers who attend college full time spend nine hours a day on child care and housework. “Single mothers in college are doing double and triple duty to make a better life for their families, but too few have the support needed to juggle the competing demands of college, parenthood and employment,” according to Lindsey Reichlin Cruse, the institute’s current study director who was quoted in Diverse: Issues in Higher Education, a publication of the College Media Association. But single moms — including those at Mercyhurst North East — are not alone. U.S. Census Bureau statistics released in 2016 found that children living with a single mother make up the second most common family arrangement in the U.S. That’s nearly triple the percentage of children living with single moms in 1960. These facts, and a plethora of others, are of increasing interest to colleges and universities. More than one-quarter of all undergraduate students in America are raising children while attending college, according to the Best Colleges website. Single moms, it finds, make up 43 percent of the student-parent population, while single fathers comprise 11 percent. About three years ago, Merychurst University President Michael Victor became intrigued by the concept of a Women With Children program while at the Conference for Mercy Higher Education in Washington, D.C.
Misericordia University, a private Catholic liberal arts university in Dallas, Pennsylvania, and the College of Saint Mary in Omaha, Nebraska, both founded by the Sisters of Mercy, offer similar single-mother programs. Victor proposed the idea for Mercyhurst North East, which has a current enrollment of 660. Mercy Sister JoAnne Courneen, a member of the board of trustees, visited Misericordia and two other institutions to learn about their programs. She and Jackie Fink, the director of administrative services at the North East campus, also conducted more research about its benefits and challenges, including ensuring the safety of children on a college campus. The benefits of the Women With Children program were so evident that Mercyhurst fast-tracked it and welcomed the first cohort last fall. Fink believes Mercyhurst is now among only a handful of universities nationwide that offer year-round, free on-campus housing for single mothers. Yet, according to BestColleges.com, there are several more, specifically 20, that are reshaping education by offering programs for single parents, both moms and dads. 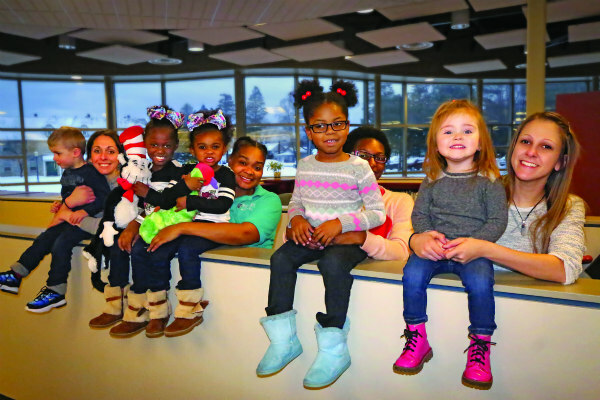 At North East, the four student-moms and their children share connecting townhouses at the northern edge of campus, only a short walk to the school’s Ridge Library. “And what’s your mom studying?” she’s asked. For toddlers, it doesn’t get any simpler than that. Yet, the moms enrolled in Mercyhurst’s Women With Children program have much more complicated lives and responsibilities. Each of them was admitted to the program because they were living at or near the poverty level. Only single mothers with up to two children, between the ages of 2 and 10, are eligible. Daijah, Jasmine, Quanshay and Jennifer all share strikingly similar stories. All of them were attending college or some other post-secondary certification/training program when they became pregnant by a boyfriend. None of them married their children’s fathers, but all of the kids are in touch with their dads in one way or another, either through occasional face-to-face visits or via cell phone. Each mom also has depended heavily the past few years on family — either parents, grandparents or aunts — to help them with baby-sitting, car rides and emotional support. While housing had been one of the biggest stressors in their lives, it also motivated them to move on. Daijah, at one time, was working and living in Erie, paying $750 a month for an apartment. She lost her job, forcing her and her two daughters to return to her grandmother’s home. Quanshay was living with her mother in Erie, but the “racket” created by her younger brother and sister, along with her own needy child, wasn’t conducive to studying. Jasmine’s parents’ house in Crawford County was old and filled with cigarette smoke. Little Noella made about four trips to the hospital last year for asthma-related issues. Jennifer, at 33 the oldest of the moms, was paying $500 per month for an apartment in North East. She knew she had to break the cycle of poverty and uncertainty. They all applied and were accepted to Mercyhurst North East, and all of them have chosen health-related majors, merciful in their own right. Jennifer is majoring in health studies, Quanshay and Daijah are in the licensed practical nurse program, and Jasmine is studying for her registered nurse degree. Jackie Fink, who now also serves as the Women With Children program director, meets regularly with each of the moms. She ensures the institutional safety of their children and that the women take advantage of all the benefits of the program, including family enrichment classes, individual goal planning sessions, academic support, career services, on-campus counseling, and parenting and information workshops. Erie Dawn, a local advocacy agency for women in transition, partners with the program to provide assistance to the mothers on an as-needed basis. Nearby St. Gregory School has opened its doors to any of the children eligible for its preschool and elementary programs, but at this time the women have secured day-care services elsewhere. “This program is going to take these women into new career paths in which they’ll be independent and good providers for their families,” Fink says. According to Jasmine, the Women With Children program bypasses any negative judgment of single moms. It also has bolstered self-confidence and instilled an enduring hope for the future.